/ Disney Cruise Royal Court Royal Tea – Is It Worth It? Are you thinking of booking the Disney Cruise Royal Court Royal Tea? All of the Disney Cruise ships now offer the Royal Court Royal Tea. However, at $210 for children and $69 for adults, this is an experience which takes some thinking about! Is the Disney Cruise Royal Court Royal Tea really worth the extra cost? Here is our guide to what the Royal Tea involves so that you can make up your mind about whether or not this Disney Cruise experience is for you. The Disney Cruise Royal Tea was initially only available on the Disney Fantasy. However, it is now available on all of the Disney Cruise ships. The Royal Tea is definitely one of those hot ticket Disney cruise experiences – you probably need to book it before you sail. The Royal Tea is designed for children aged between 3 and 12. All adults must be accompanied by a child! This really is a child-centered experience. The Royal Tea really isn’t about the food. You can find an abundance of food on the Disney ships, but the Royal Tea is not the place to go if you want your plate piled high. The Royal Tea is all about the interaction with the Disney Princesses. The Royal Tea is by far the best Disney Princess interaction you will get anywhere on a Disney cruise. The Disney Princesses are out in force on a Disney cruise, but this is the place if you want to spend some extended time with them. If you have a Disney Princess obsessed child, we really can’t recommend the Royal Tea enough – if you can deal with the $300 plus price tag. Boys are welcome too, but to be brutally honest this is a momother-daughter experience. If you have a girl who loves the Princesses and you want to have a magical experience, this is a splurge you really want to consider. Be aware that the Royal Court Tea is very popular and books up very quickly. We advise that you book this experience as soon as you are able to do so, prior to your cruise. If you do not get one of the coveted spaces do not give up. You can always go to Guest Services as soon as you arrive on the cruise and ask to be put on the waiting list. Cancellations do happen. So don’t give up! So What do you get for your Money at the Royal Court Royal Tea? The main attraction is the up close and personal time with the Disney Princesses. However, there is a lot more to it than that. The whole experience begins when you receive a very special invitation in your stateroom. You can either keep this a secret until the actual day, or share it with your child when you see it. The invitation is a nice touch and just adds to the anticipation of the experience. Don’t go there for the food. It’s a nice experience, but it isn’t going to be a mind-boggling culinary experience. Aside from a lot of quality time with the Disney Princesses your little ones will get some pretty awesome gifts. You and your children will arrive outside the restaurant. Of course ,the first thing that will happen is that you will be sprinkled with Pixie Dust! What better greeting? Lady Chamomile and two Pages (yes we know they are Cast Members from the shows, but let’s not spoil it) will introduce each child and they will present them with a crown. This is simply the warm up to the much better gifts in store! The Disney Cruise Royal Court Royal Tea is relatively small and that is what you will notice as soon as you walk into the restaurant. This is an exclusive experience and this really creates the impression that you will get extra special attention. We know the cost is high, but we think the personalized attention makes it worth it for Disney Princess fans. You will be sharing a table with other guests. This adds to the experience as they will most likely be just as Disney Princess oriented as you are! The first thing that you will notice as you are being seated at your table is the beautiful Disney Princess doll on your child’s chair. This will most likely be the biggest hit of the day and most likely the cruise. The dolls are beautiful and will probably become your child’s best friend for the rest of the Disney cruise and beyond. The main draw of the experience is the interaction with the Disney Princesses. Don’t expect to see Anna and Elsa here as we haven’t yet heard that they appear – they really are the most elusive of the Disney Princesses. You are most likely to see Cinderella, Belle and Ariel. We know that Tiana appears a lot on the Disney ships, particularly at Tiana’s Place on the Disney Wonder. However, she doesn’t seem to regularly appear here. As with all Disney Character experiences, nothing is ever guaranteed. 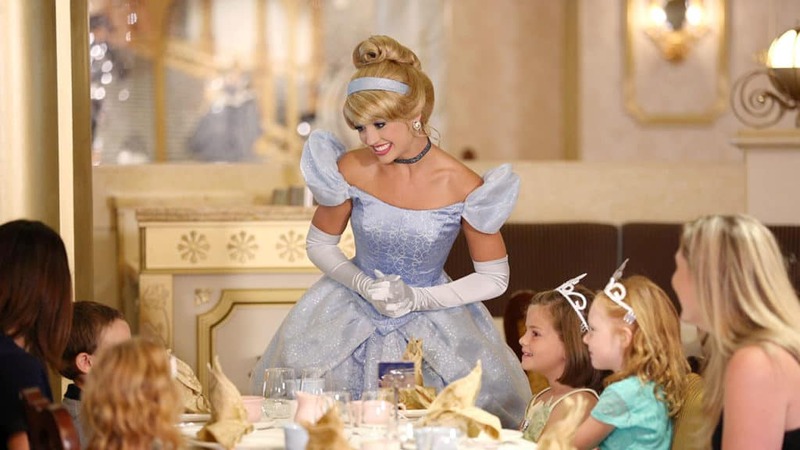 We think Cinderella is a pretty safe bet at Disney Cruise Royal Court Royal Tea though! The gifts for the Royal Tea do not stop with the Cinderella doll. Your little Princess will also receive a link bracelet, a necklace with Disney Princess charms and an autograph book. If you bring a boy to the Royal Tea they will receive a Duffy The Bear, an autograph book, a cinch bag and a sword and shield. 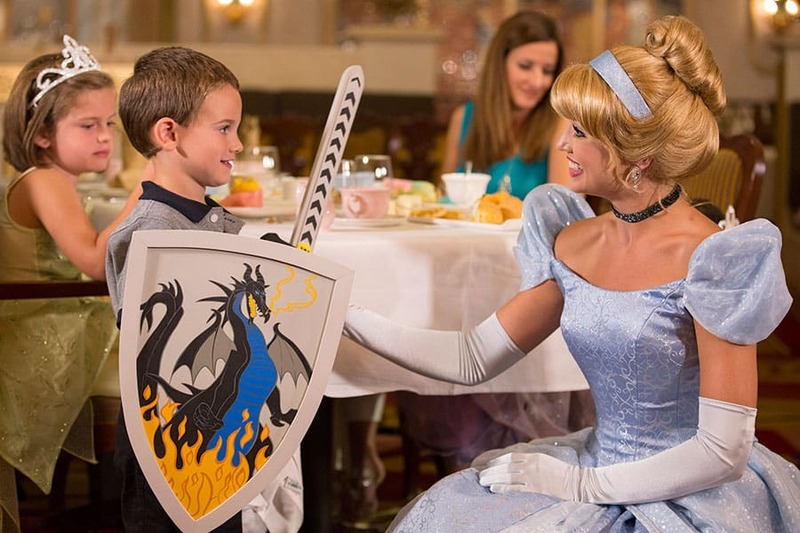 The gifts at the Disney Cruise Royal Court Royal Tea are very high quality and your child will no doubt be pleasantly overwhelmed by the presents given out. It really does add to the magical experience. A very nice touch is that the Disney Princesses hand out the additional charms. This makes them so much more special. Your child can remember receiving the gifts from the Disney Princesses rather than them just appearing on the table. The musical box is a wonderful place to keep all of the jewelry gifts. Do You Need To Dress in A Princess Costume? A lot of the children do dress in a Princess costume. This is part of the whole experience and it can be a good opportunity for your child to wear their favorite costume. If you don’t already have a costume, you will not be surprised to know that they are available to purchase on the ship! What About the Food Served at Disney Royal Court Royal Tea? We actually think that this is secondary to the rest of the Royal Tea experience on the Disney Cruise. You can find amazing food everywhere, pretty much non-stop on a Disney cruise. The Royal Tea experience is about other things, but obviously, you want to know what your money actually will get you in terms of food at the Royal Tea. Food is in abundance on the rest of the Disney ship, but it really isn’t here at the Royal Tea. Your table will be served with some small sandwiches and pastries. They are all beautifully presented, but let’s say they are pretty scarce. You will probably be negotiating with your table mates for the chocolate eclairs! This experience is definitely not about the food. It’s well presented, but don’t come here hungry. The Royal Court experience is one hour long. Then it is most definitely over. We understand that all magic comes at a price and it does have to end – but you do need to be aware that it is one hour only and then everyone is going to leave. We would recommend the Disney Cruise Royal Court Royal Tea to anyone who has a true Disney Princess in their party. That age when your child is truly able to experience the magic of the Disney Princesses is most likely going to be so short, we advise you to capture it when you can. A Disney Cruse Royal Tea experience will ensure that it is magical for you. The final royal touch? You will receive a photograph of your child and the Disney Princesses in your stateroom. This is a fabulous memory of your Disney Cruise Royal Court Royal Tea. This is undoubtedly a splurge for your Disney Cruise. However, there are many ways to save money. See our guide to saving money on a Disney Cruise.